A stuck solar array on the Intelsat 19 broadcasting satellite dislodged itself last week, but engineers will not know how much of the craft's mission can be accomplished until its communications payload is activated. The satellite's south solar array stayed folded against the spacecraft following its deployment from a Sea Launch Zenit 3SL rocket June 1. Intelsat announced last week the solar panel unfurled June 12, soon after Intelsat 19 reached geostationary orbit about 22,300 miles over the equator. "Currently, we are conducting tests to establish the performance, power level, structural integrity and operability of the south array panel," the company said in a June 14 statement. 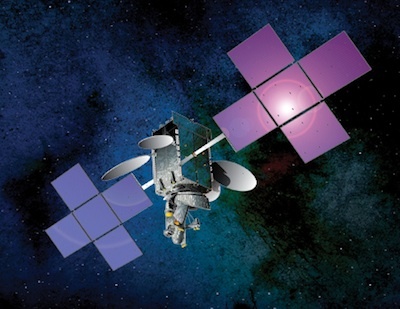 Dianne VanBeber, Intelsat's vice president of communications, said Tuesday telemetry received from the satellite soon after it arrived in geostationary orbit indicated the solar array had deployed. Officials believe Intelsat will have access to a significant portion of the satellite's communications payload, which includes 34 Ku-band and 24 C-band transponders. But Intelsat will not know exactly how much of the payload can be operated until engineers determine the performance of the solar panel, which may still contain damage. Controllers are activating Intelsat 19's communications payload this week. The craft's Ku-band antenna was deployed Monday, according to Intelsat. The satellite was manufactured by Space Systems/Loral of Palo Alto, Calif.
Intelsat 19 was intended to distribute video and television services across the Asia-Pacific region from a position along the equator at 166 degrees east longitude. The craft was built to replace the Intelsat 8 satellite launched in 1998. 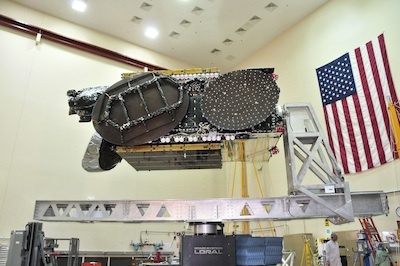 Officials expect the Intelsat 8 satellite will remain in service through the end of 2019, and Intelsat says there be no interruption in service if Intelsat 19 is unable to attain full operations. Engineers are studying what caused Intelsat 19's solar array trouble, and the investigation's focus so far is on an unexpected, isolated event which registered on microphones and pressure sensors during ascent inside the payload fairing of the Sea Launch Zenit 3SL rocket. The signature resembles an event observed on the 2004 launch of the Telstar 14/Estrela do Sul 1 communications satellite, another craft built by Space Systems/Loral which failed to deploy one of its solar panels. Other Space Systems/Loral spacecraft on Sea Launch missions have had no solar array difficulties.